I had breakfast this morning with a student from VCU. I was introduced to him by email through a colleague who had spoken with him. James wanted to know more about PR and, specifically, about PR work in nonprofits. Early in my career I had good mentors and met with individuals who were willing to share their experiences and advice so I’ve always tried to do the same. I have one rule, though, if we’re going to meet in person, it has to be breakfast. That way I can tell how committed they are. James was committed. He arrived by bike through thick fog and had lots of questions. He shared his experiences, too, and he’s on the right track. I suggested some articles for him to read and websites to review. I also encouraged him to get on LinkedIn because most college students aren’t, but most recruiters are. I encouraged him to connect with me. I’m perusing my list of contacts for some additional introductions for him. So why take the time out of my schedule to meet with students? I enjoy helping them. And I love recalling my college days and the anticipation of what was ahead of me. The students always remind me of why I do what I do and of some of the basics that may have slipped. It’s a win for both of us. I hope it was worth the bike ride, the fog and the early morning breakfast. I think his tweet means it was. Have you thought of offering your wisdom to a college student? If you’re already doing it, what other advice would you offer? When Virginia Commonwealth University’s basketball team kept advancing in the NCAA basketball tournament this past spring, the communications team managed it as a crisis. Promoting the team’s athletic success happened naturally. But this was also a time for VCU to shine and to highlight its academics and gain additional donor support. That meant that many departments were involved in communications efforts, including Student Affairs, Business Services, IT, Alumni Relations, Development and Police. “This was an opportunity to highlight messages that are often ignored,” Anne said. 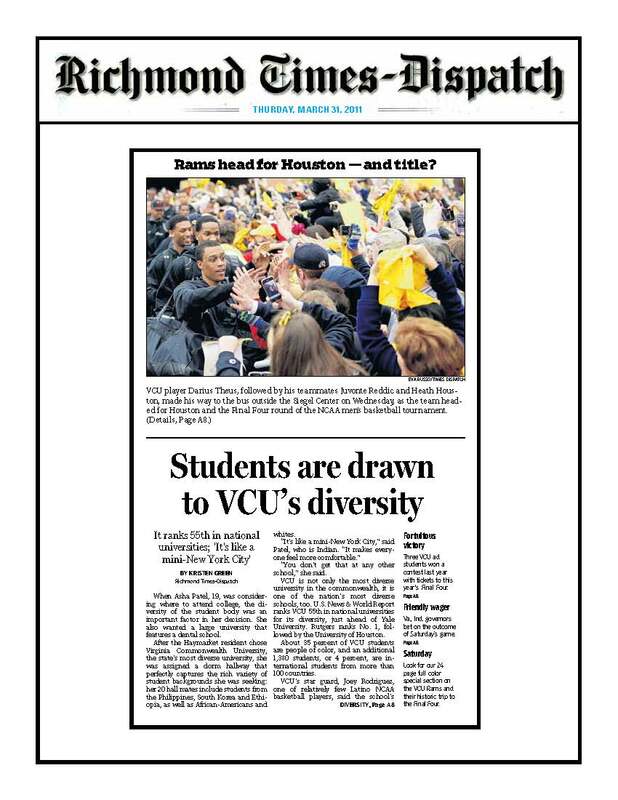 One story that was placed during this time was about VCU’s diversity. In the first quarter of this year, the school had about 14,000 media placements. During the 27-day period surrounding the tournament, VCU received 11,200 media placements, which they estimated had a total ad value of $15.5 million. The excitement around the Rams journey to the Final Four also met a much larger presence on social media platforms. Three people were assigned to social media around the clock. The school’s Twitter presence increased 7, 551 percent! VCU placed 20 home page features on its website during the period. “We reached ‘volcanic’ status in Google trends,” Pam noted. The communications team also was diligent in capturing all of the moments and created a digital archive. I’ve never tried speed dating but I did try my hand at speed interviewing. Fortunately, I had the easy role, which was that of interviewer. The idea originated with students with Virginia Commonwealth University’s chapter of the Public Relations Student Society of America. It was an opportunity to “give students exposure to PR professionals and the interviewing process,” said Carol Mawyer, assistant director for student services and scholastic journalism at VCU. “I hope our students learn how to present themselves confidently and professionally when provide with a limited window of time so that the next time they are at a networking event, they can approach it as if it’s a speed interview,” Carol said. Although many of the students had never experienced a professional interview, it was hard to tell. Despite the hour of the day (5 p.m.), each one came dressed professionally with a resume and put their best foot forward. I thought back to my early days of interviewing and wondered if I came across as polished as these students did. Of course, those of us conducting the five-minute interviews couldn’t resist offering some critiques. Many of the students said they wanted to enter PR because they were people persons. We explained that PR is more than being a people person. We talked about creativity, writing, goals and research. And we pointed out it’s more than graphics or social media, which seemed to be the hot areas of interest. My favorite question to ask is “Why should I hire you?” Quite simply, it’s the elevator speech we’re all taught we should have on hand. Based on their answers, most of these students are ready for the real world.